» 1.5m Long with integrated cable management. PowerPro cable’s micro meshed “DUAL ELASTO FIBRE” Nylon braided cable makes it stretch resistant, Tangle Free, and extremely twistable. Specially designed METAL CONNECTORS with “VULCANIZED RUBBER JOINT” protects end plugs against daily wear and oxidation. Uses a 56KΩ pull-up resistor for incredible safety and reliability. Supports Data Sync and Charge for all Type C devices like MacBook 12” (2015),MacBook Pro 13” / 15” (2016), Google Pixel / Pixel XL / Pixel 2, Moto Z, Gionee S6, Samsung Galaxy S8 / S8+, OnePlus 3 / 3T / 5, Lenovo Zuk Z1, Nexus 5X, Nexus 6P, ChromeBook and all the other type-c devices. 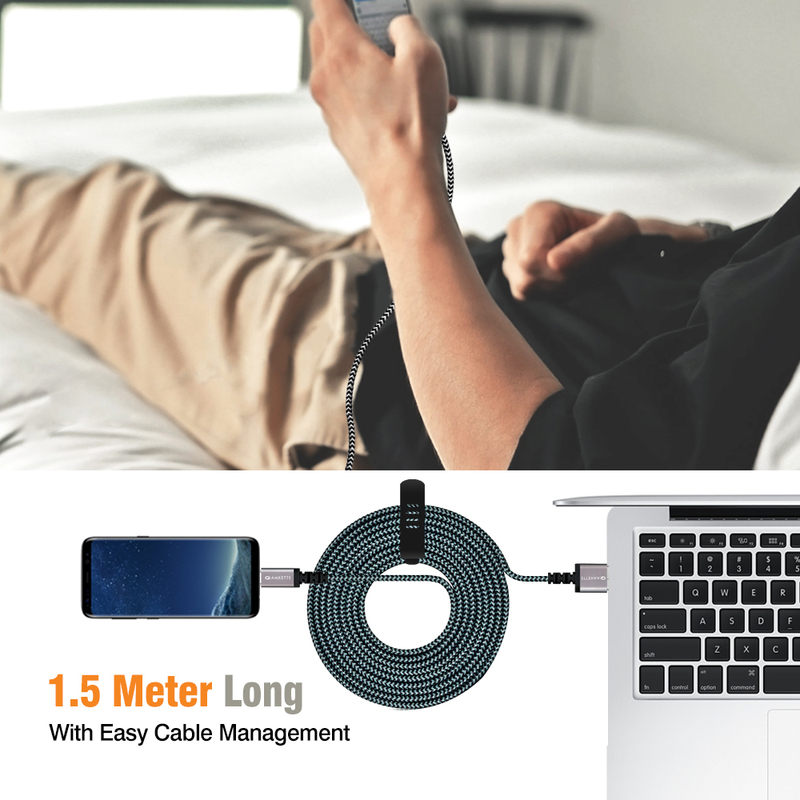 1.5 meter LONG cable ensures that you can simply use and carry it anywhere be it office, home, car, etc. No worry again for the short length of cables, make your life more convenient. HASSLE FREE 1 YEAR WARRANTY from a company that has valued CUSTOMERS for over 30 YEARS. 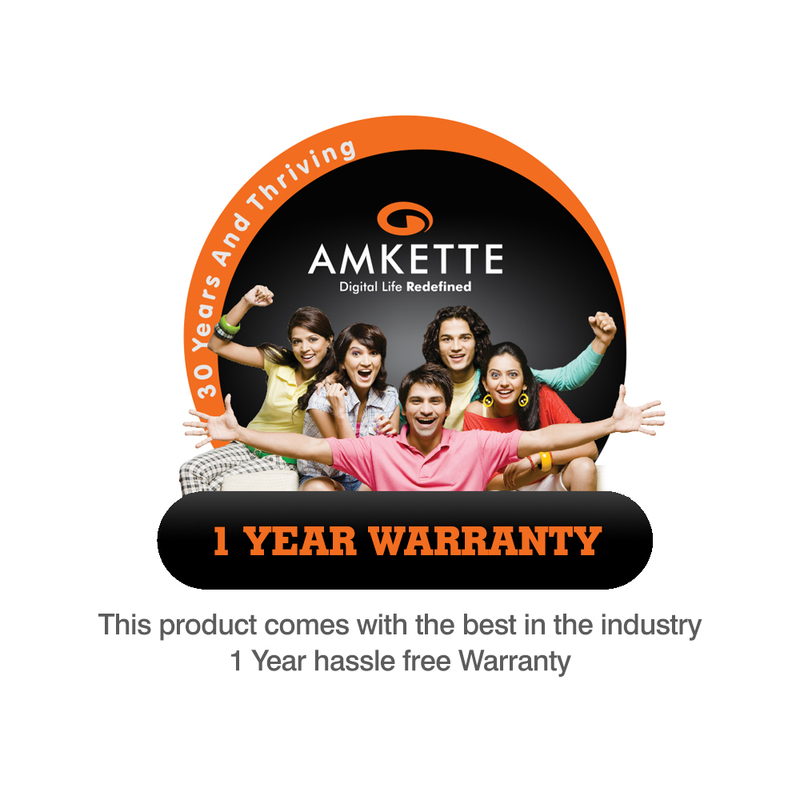 So buy with confidence, when you buy with Amkette. 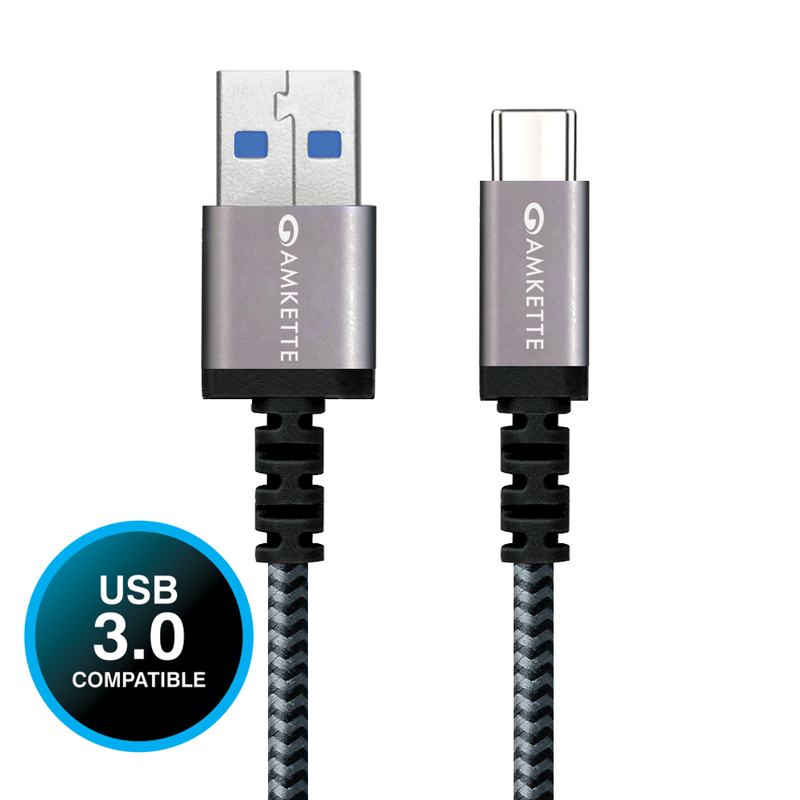 Amkette USB 3.0 Type-C PowerPro cable ticks off all the boxes as far as demanding qualities and durability are concerned. With high speed data transfer (up to 5Gbps) and fast charging with up to 6.0A, it allows you to power up your devices fast. 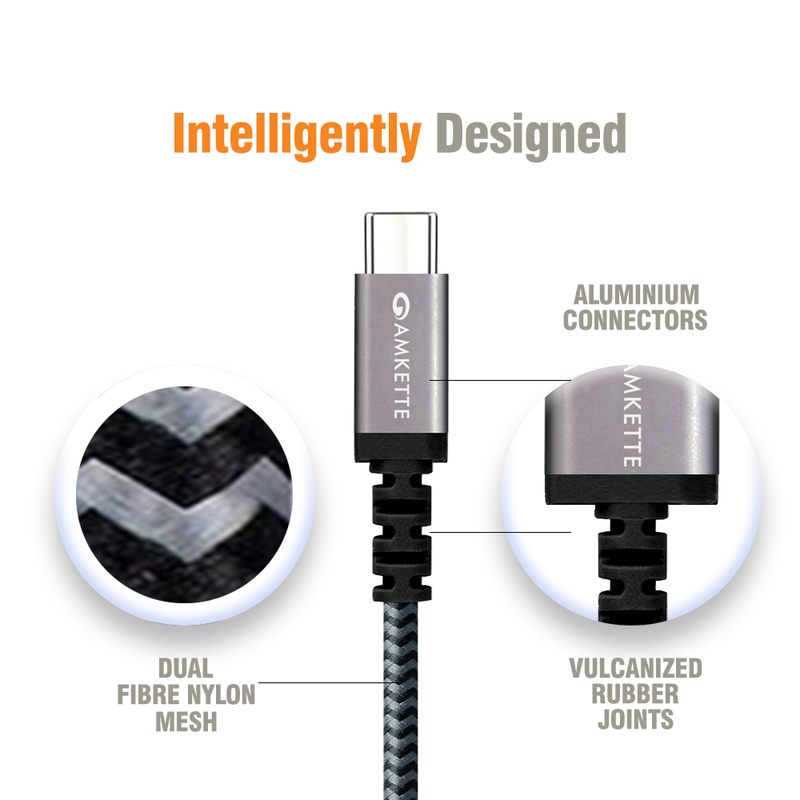 The “DUAL MESH ELASTO FIBER” Nylon Braided cable and space grade metal connectors with “VULCANIZED RUBBER JOINT” makes it strong enough to fight out fraying and protects against day to day wear and tear. 1.5m cable with buttoned belt strap lets you neatly pack away when not in use. 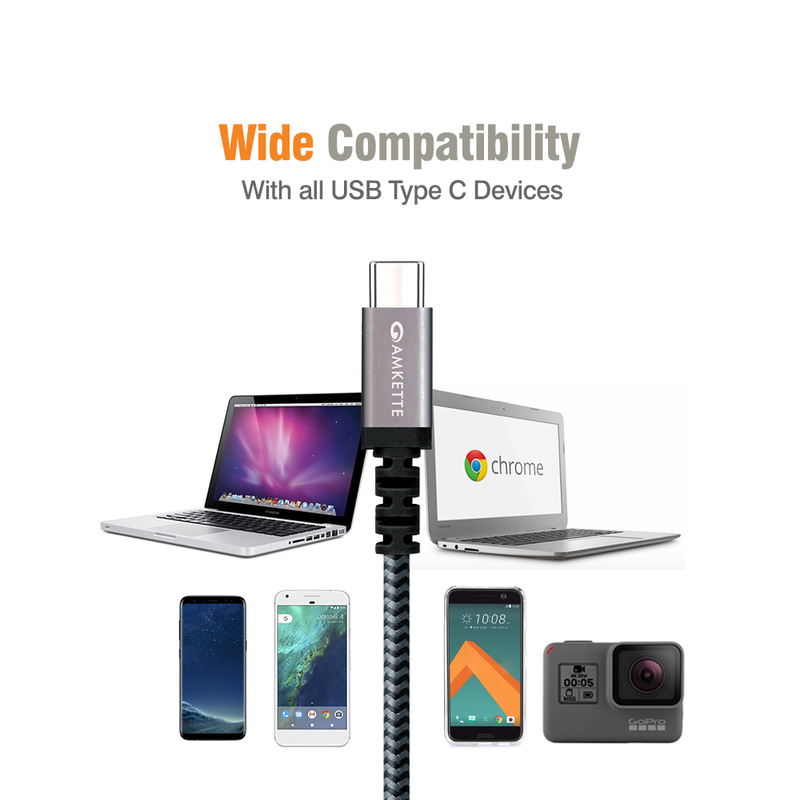 Since the PowerPro Cable supports high current flow it is compatible with all USB Type C devices like MacBook 12” (2015),MacBook Pro 13” / 15” (2016), Google Pixel / Pixel XL / Pixel 2, Moto Z, Gionee S6, Samsung Galaxy S8 / S8+, OnePlus 3 / 3T / 5, Lenovo Zuk Z1, Nexus 5X, Nexus 6P, Google ChromeBook , GoPro Hero5 and all the other type-c devices. 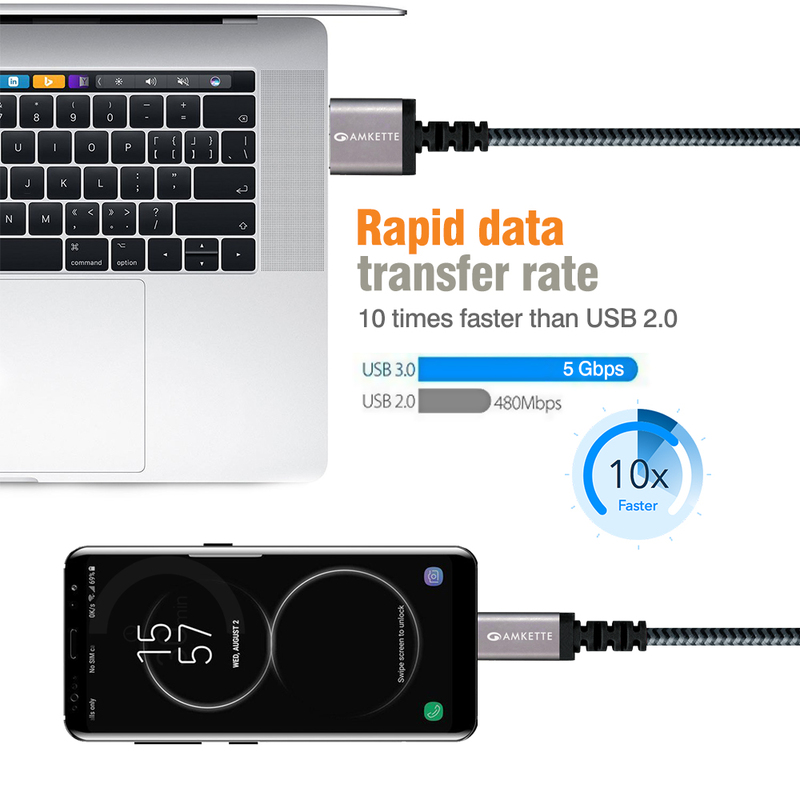 Super Fast Charge enabled with up to 6.0A of current and USB 3.0 (5 Gbps) data transfer speed, you can charge and sync your devices faster than ever. 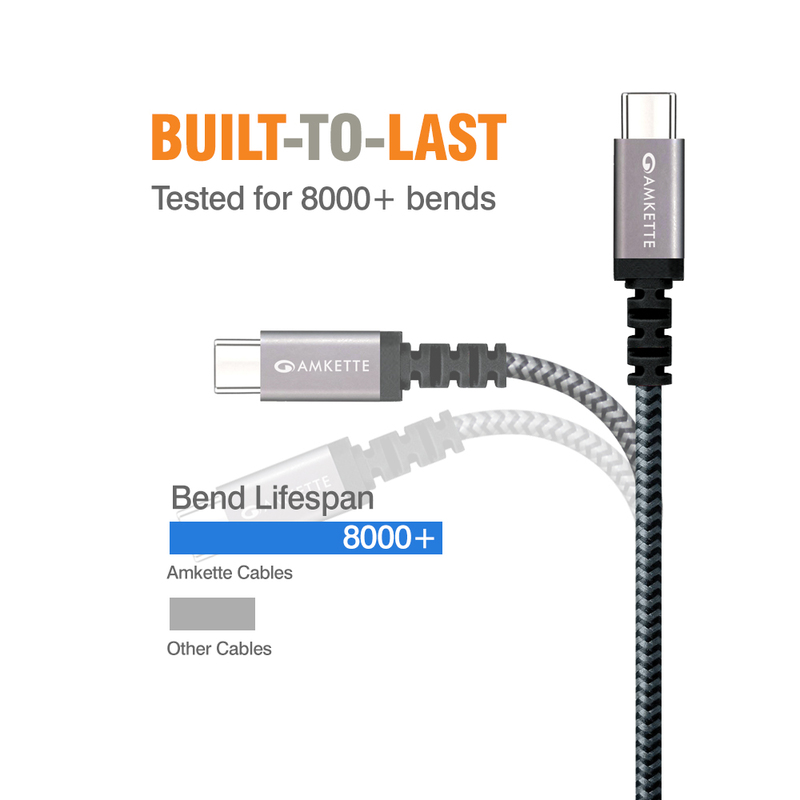 Lab Tested and Proved to have a bend lifespan of over 8000 bends. Dual Mesh Nylon braided outside for extra strength. 56K ohm pull up resistor ensures Safe and Fast Charging. Industry Standard Type-C compatible with any USB-C powered device on the market now and forever. Google Chromebook all other Type C devices. Note: Does not support OnePlus DASH charging. Super strong, USB 3.1 Type C Cable. Works perfectly in fast charging mode. Really like the small attachment for cable management. Good thought! Thanks Amkette for making a good quality product!